Helen Pages paper dolls are charming, the work of an artist with a delicate touch. She made her first paper dolls at age four, and her creative talent has allowed her to explore many artistic avenues besides her captivating and collectible paper dolls. She has illustrated greeting cards and childrens books for the Samuel Lowe Company and the Swann Company. She has painted a number of subjects on canvas and masonite. Once she painted a mural of flowers in oils on the dining room wall over the upright piano! She and her husband Gregory, whom she wed in 1933, created puppets and presented full length productions of Cinderella and Tinderbox. During the 1960s, Helen expanded her artistic horizons even further by studying the Oriental style of painting known as sumi-e (simple strokes rendered swiftly with special ink on rice paper). The result? A one-woman show in St. Petersburg where she and her husband retired. There, Helen became immersed in the world of doll collecting and miniatures, focusing mostly on paper dolls. 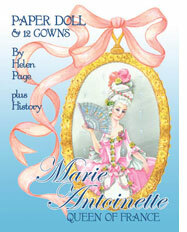 She also created party favors, convention souvenirs and special paper doll commissions for collectors. Helen Lamson Page was born in Charleston, West Virginia, on October 1, 1909. She graduated from Red Bank (New Jersey) High School in 1927 and Pratt Institute in Brooklyn, New York, in 1932. Helen enjoyed her later years in Florida, and continued to paint miniature paper dolls until late in 2006, when tremors in her hands made it impossible for her to work any more. She passed away on February 21, 201,3 at the age of 103.